Выбираем готовые туры - собираем в корзину - отправляем клиенту. Клиент задал вопрос в соцсетях или мессенджере - он напрямую добавляется в базу. Внутренная система уведомлений, e-mail рассылки и смс-оповещения. Для потенциальных и постоянных клиентов! Вы больше не пропустите вопросы клиентов в социальных сетях и мессенджерах. Вы вводите данные туриста 1 раз в жизни и забываете о рутинном заполнении договоров. Турист может оплатить онлайн, деньги поступают напрямую на ваш счет. Вы видите все этапы сделки, сколько клиентов зашли/задали вопрос/оплатили. Вы знаете причины отказов и что делать. В соответствии с законом РФ каждое турагентство обязано применять в своей работе онлайн-кассу. 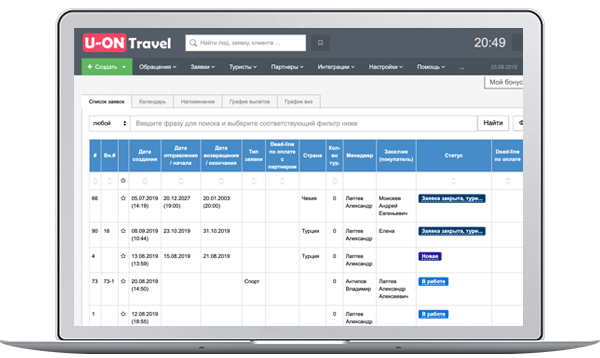 From the first lines I want to say that this is one of the best crm systems in tourism. The main advantage when working with the crm system can be described in three words: reliability, simplicity and efficiency. For more than 5 years we work with such known companies as: a network of travel agencies Hot tours home network travel agencies Shop of Burning Permits a network of travel agencies TUI and a others. Your business development business, they trust us, trust our crm the system of tourism. We help our clients to feel confident in the tourism market. The simplicity of the system is that the crm system business helps you optimize your work so that any new people come into this business could easily be run in the system. Very convenient and affordable crm system for staff members and for leaders. Integrated online storage of all data has the ability to connections restricted access that allows managers see all accurate and necessary information in a single instance. Our proposal for a wallet , as there are rates free and paid. With them, the more accurately you can see the PRICES, or call us at 8 (495) 961-1229, where we will reply to you at all your questions. So the same questions can send us email. mail support@u-on.ru. 2011-2019 © LLC U-ON. All rights reserved. Placing the mark, I give my consent to processing of my personal data in accordance with the law №152-FZ On personal data and dated 27.07.2006 and I accept User agreement.